↑ Stryer L, Berg JM, Tymoczko JL (2002). Biochemistry (5th সম্পাদনা). প্ৰকাশক San Francisco: W.H. Freeman. ISBN 0-7167-4955-6. http://www.ncbi.nlm.nih.gov/books/NBK21154/. ↑ Schomburg, I; Chang, A; Placzek, S; Söhngen, C; Rother, M; Lang, M et al. (January 2013). "BRENDA in 2013: integrated reactions, kinetic data, enzyme function data, improved disease classification: new options and contents in BRENDA". Nucleic Acids Research খণ্ড 41 (Database issue): D764-72. doi:10.1093/nar/gks1049. PMID 23203881. ↑ Radzicka, A; Wolfenden, R (January 1995). "A proficient enzyme". Science খণ্ড 267 (5194): 90–931. doi:10.1126/science.7809611. PMID 7809611. ↑ Callahan, BP; Miller, BG (December 2007). 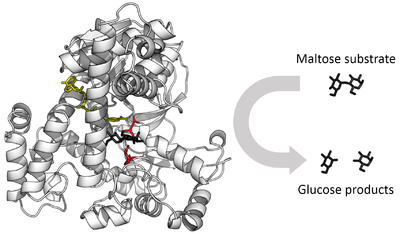 "OMP decarboxylase—An enigma persists". Bioorganic Chemistry খণ্ড 35 (6): 465–9. doi:10.1016/j.bioorg.2007.07.004. PMID 17889251.